Recruiting has always been a crazy business, never more so than today. From the hundreds of different rules, to the different styles of coaches, this is a process that can swallow kids and families whole if it’s not handled the right way. Conversely, if it’s done the right way, it can be the greatest experience a family ever goes through. I’ve seen this process drive a wedge between a kid and their parents, and have even seen it drive a wedge between the parents themselves. I’ve also seen it bond a kid and his parents together, making it a positive experience and giving them memories for a lifetime. It would literally take books plural to go over everything in this process. What I wanted to do was start a series of “Recruiting Tips” that I can put out for athletes and their parents to read and apply to help their cause in getting recruited. I went through this process twice as a player; once out of high school and the other time out of junior college. I also coached for a year at OSU and was able to sit in on closed door, staff meetings. Talk about eye opening! I learned more in that year about this process than my 25 previous years combined. Since that time, we’ve sent more kids on to play college football than any other football academy in the northwest. And not just D1A or D1AA, we’ve sent kids to every level. In fact, the majority of kids out of the northwest end up going to D2, D3, or NAIA schools. So getting back to my original intent, I want to give my first few “Recruiting Tips”. #1: Be Humble! There’s a saying I love that applies to this point. It says, “beggars can’t be choosers”. If you don’t have any offers, you shouldn’t close the doors on any schools. I hear kids and parents all the time saying that they wouldn’t ever go to this school, or wouldn’t ever play for that program. My first response is to ask if they have any offers. If they don’t, they shouldn’t raise their nose at anyone. The second point I make is this: even if you don’t like the school or program, still let them recruit you. I don’t want a kid to go anywhere they don’t want. But what they don’t think about is how this process works. What’s the first question college coaches ask when they talk to a kid or family? They ask who else is recruiting you. If you can’t name anyone, that immediately throws up red flags to them. Colleges are always afraid to be the first school to recruit or offer a kid. Look at it from their perspective. If they offer Joe Blow and no one else does, and he doesn’t pan out, best case scenario they look bad, worst case scenario they’re fired. If 20 other schools were recruiting or offer Joe Blow, if he comes to their school and doesn’t pan out, they don’t look so bad because 20 other schools were wrong on him too. It’s like the dating process. If you want to date the Homecoming Queen, you’ve got to get her attention. Once you do, you’ve got to play your cards right. If no other girls want you, she’s thinking two things. First, why don’t’ any other girls want him? Now she starts looking to find flaws with you. Second, she now knows you have no options. So she has no competition and can string you along and get you whenever she wants, however she wants. Now, take the same situation but imagine 20 other girls want you. Now, she’s thinking two different things. First, all these other girls want him, so maybe I’m missing something and need to look harder. Second, she’s now got competition. So if she wants you, she has to step up to the plate and show what SHE has to offer YOU. Same boy and girl in each scenario, all you’ve done is change the status quo. And that’s all we’re trying to do in the recruiting process. Take a school we’re interested in, and instead of selling our self to them, make them sell themselves to us. Translation: If a school knows no one else is recruiting you, they won’t put any kind of offer on the table and hardly any effort into recruiting you. They know you have no options and that they can get you whenever they want, for the bare minimum. Now, take that same school but say you have 10 other schools recruiting you. Now that school knows they have to step up their efforts to recruit you and have to at a minimum match any offer you’ve received. Again, we’ve changed the status quo. #2: Respond to every letter, email, or phone call. Kids and families screw this up all the time. They’ll get a questionnaire from a school in Illinois and not fill it out or return it. Or they’ll get an email or phone call and not reply. When I ask them why, they generally give two responses. First is that they wouldn’t go to a school that far from home. Second, it’s a small college or not the level they want. Here’s my response. 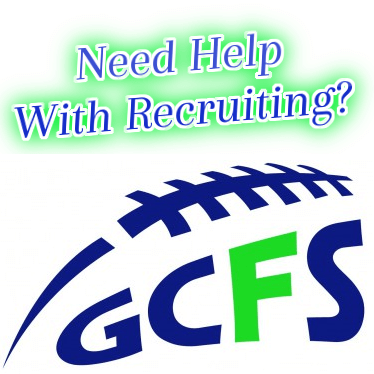 Even if you don’t want to go away from home, like we mentioned in Tip #1, the more schools recruiting you the better. ESPECIALLY if you want to stay close to home. No local school wants to lose a local player to an out of state or out of region school. So if you really want to go to that local school, let those out of state schools recruit you and put packages on the table. Then take those back to the local school and tell them they have to match or up that offer. My other response is even if you think you’re a D1A or D1AA caliber kid, still respond to coaches from schools at lower levels. In the coaching world, job security is not a luxury. There are some coaches that have been at 5 schools in as many years. Here’s a couple examples: Jim Harbaugh and Jay Locey. Jim Harbaugh was the head coach at San Diego. The next day he was the head coach at Stanford! Jay Locey was head coach at Linfield, a D3 school. The next day he was assistant head coach and RB’s coach at OSU. What do you think the first question Mike Riley asked coach Locey was? He asked him if there were any kids he was recruiting or knew about that OSU should be recruiting. So if a kid never gave Jay Locey the time of day when he wrote or called from Linfield, guess who’s now NOT getting recruited to OSU? On the flip side, if a kid developed a good relationship with Jim Harbaugh while he was at “lowly” San Diego, guess who’s got a good shot at now being recruited by Stanford? So those are my 2 “Recruiting Tips” for now. The 1st, be humble. The 2nd, respond to everything and everyone. This process is not an exact science, and no one is an absolute expert. All you can do is try to say and do things the right way, and help your cause. I will have more “Recruiting Tips” coming soon.